Tackling a new instrument can be intimidating, but with this easy-to-use guide, you'll have no trouble at all! From selecting, tuning, and caring for your fiddle to mastering various music styles, Fiddle For Dummies walks you step-by-step through everything you need to start playing the fiddle like a pro. You'll discover how to hold a fiddle, master fundamental techniques, and take your skills to the next level. This title also features companion audio tracks and instructional video clips hosted online at Dummies.com to help further enhance your skills. The fiddle is a popular instrument across many continents, and is a favorite for many because it is small and portable. Playing the fiddle can expose you to a range of musical styles from all over the world, such as Irish, Scottish, Celtic/Cape Breton, country, folk, bluegrass, and more. Plus, if you're already a violin player, you'll impress yourself and fellow musicians as you unlock your instrument to open up a whole new world of sounds. 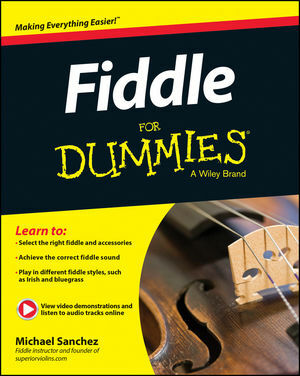 Whether you're a complete beginner or a violin player looking to branch out and try something new, Fiddle For Dummies will have you fit as a fiddle in no time. Michael Sanchez has played fiddle in many country music bands, as well as playing fiddle for the Medora Musical, a well-known and popular show held each year in North Dakota. He is CEO and creator of Violin Tutor Pro (www.violintutorpro.com) and is CEO of Superior Violins (www.superiorviolins.com).